One of Exeter's most respected citizens, Harry Burke, died on April 24, at the age of 80, but his life and legacy lives on through an impressive collection of original art. Funeral Services for Mr. Burke were held at Dinney Funeral Home in Exeter on April 29. What made the service unique was the impressive exhibition of artworks that hung on the walls of the funeral home in Mr. Burke's honour. The more than 30 paintings represented a small portion of the extensive collection of works created by Mr. Burke. The paintings were selected by his son Tom to show his father's diverse talent, his interest in local history and community, and a lifetime achievement in art and business. From portraits of Exeter's founding families, to Group of Seven styled landscapes, from whimsical caricatures to colourful and realistic portraits- Mr. Burke's work spanned an interest in many subjects and many years. His son Tom notes, "He wanted to be known as an artist who painted in two centuries and in two millenniums." Mr. Burke was a staunch realist in his painting and he was passionate and determined about his art. He was identified as a child prodigy who, at the age of 14, trained at what is now the Ontario College of Art. He studied under the tutelage of great Canadian painters like Frank Carmichael of the Group of Seven and World War I artist, J.W. Beatty. He also learned the trade of cake decorating, working with his father in Burke's Scottish Bakery in Toronto. A master cake decorator himself, he was featured on CBC-TV's first colour broadcast with Kate Aiken. Mr. Burke's life work was not to be a baker, rather his career and philosophy was greatly influenced by his service in World War II. Norm Evelands of the Exeter Legion said of Mr. Burke at the funeral service, "Had Harry not enlisted there might have been a group of eight," in reference to Canada's famous Group of Seven. Mr. Burke enlisted in 1939 in the Ontario Tank Corps Regiment where he was stationed during the battle of Britain and later fought, and was wounded, during the invasions of both Sicily and Italy, returning to Canada in 1945. According to his obituary in The Globe and Mail (April 27th issue) "he found time while in England to create a memorable mural of the Canadian landing at Dieppe, France in the Armstrong mansion in Warninglid in Sussex." The mural was admired by King George VI of England. After the war Mr. Burke returned to Ontario where he worked as a Special Projects Artist with the Ministry of Transportation and Communications. He was also instrumental in creating Sam the Safety Duck and lectured at children's safety workshops for which he was recognized as an honourary member of the Ontario Provincial Police. His cartoons by his nickname Har are famous and by which he introduced the Metric system to Canada.In 1987 he retired to Exeter with his wife Dorothy and son Tom where he continued to work on his art at his home Between the Maples. With a keen interest in local history he produced more than 50 beautiful, lifelike portraits of many of Exeter's early citizens. They are on permanent display in the Old Town Hall. It was during this time that Mr. Burke would again pay tribute to those who loves were lost in war through his art. Tom notes, "Dad said that war was six feet wide and a lifetime long." 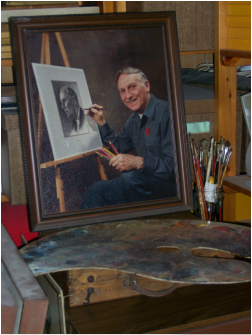 One of Mr. Burke's most astounding achievements as an artist was the creation of a memorial portrait collection that honoured the was veterans from Exeter. He found inspiration in the names that he read on the local cenotaph and over five years he painted portraits of all the Exeter and area men who were killed during World Wars I and II and the Korean War. The portraits, numbering more than 60, put faces to the names that were carved in stone. The portraits hang prominently in the Royal Canadian Legion in Exeter. This artistic achievement earned Mr. Burke the recognition as one of Exeter's most respected citizens. He received tributes from the Town of Exeter, the provincial and the federal government. The time and effort that Mr. Burke put into this collection was even more significant by the fact that he suffered a severe stroke in 1993 and lost the use of his right hand. He spent the next three months learning to use his left arm and hand for painting using the nurses as models. After his recovery he created several more portraits during the remaining years of his life, including a canvas of Madame Guerin, the French woman who started the custom of selling poppies to remember WWI soldiers. Technically, Mr. Burke's portraits are superb. They are detailed, accurate, intense depictions of real people from real times. He used a special combination of colours and oil pastels to create the delicate deep tones in his works. Each picture tells a story. Of his talent Mr. Burke was humble. He once said, "The Lord specializes each one of us and then he commands us to use it, or we'll wither on the vine." Mr. Burke believed that art was a means that he could share a message with the world. His imagination knew no bounds- as evidenced in his paintings be it local war heroes, a detailed face of a young Asian girl or in the life-size portrait of Marilyn Munroe. Mr. Burke was known as a charming and witty gentleman who left a great legacy of work. Mr. Dinney noted, "He left a great collection of work and his legacy should be preserved for future artists and local people." At his funeral service one special portrait was predominant, that of his beautiful wife Dorothy, who died in 1996. Son Tom rests assured that they are together again.